Desktop address book is a lifetime diary! Address change? Just replace the individual sheet. No more messy crossouts. Loose-leaf, 5" x 7 1/4" book has 100 sheets; each page can hold 2-4 sheets with some overlap. Find names easily with A - Z tabs for fast reference, black vinyl cover. Finally, I can update or rearrange addresses individually without needing to replace an entire page, or having more cross offs than valid names. I have been looking for an address book and could not find one in any bookstore or staples or office max store, very frustrating so was glad to find exactly what I was looking for through the Miles Kimball folks. Something so simple and you have it. I agree with other reviewers that the rings should be bigger. Impressed with the heavier paper used for the book. Blank side increases storage. I am using mine in conjunction with my Dymo printer. Current labels need a bit of a snipping before inserting. Using this for all addresses, internet information (passwords, et al). Had everything in my Microsoft Contacts but have lost those files so many times I'm embarassed to ask people for the information again. The rings definitely need to be larger, just make sure the refills will fit when you enlarge the rings!!! Had an older book like this but couldn't find refills. So glad to find this one. I owned one of these years ago & loved it. Couldn't find a replacement anywhere except at Miles Kimball. I just wish the rings were larger so it would hold more addresses. I ordered extra filler sheets so that when I need to change an address I can do so. But you really can't put more in there than the number of address sheets it comes with. A larger model for desktop, with larger rings for greater capacity, would be excellent, and the address sheets could then also be made larger to accommodate the multiple phone numbers, e-mails, etc. that people have these days. It's easy to change name/address cards. As a 79 yr old with a shaky hand, I can fix goofs. Older model - still going strong! The calendar pages in the back show that my mother bought this in 1970, and it's still going strong. Fortunately for me, she had the foresight to purchase extra pages. The metal spine and rings have lasted 42 years and I plan to use it myself now. I can't tell from the photo if the new version has metal or plastic rings. I'd recommend it if they're metal. It's not what I thought it would be. It is much smaller than I thought. I've used it, but not happy with the way the cards line up etc. The address book design was perfect for my needs. However, the rings do not close tightly and the pages catch in the rings and do not smoothly turn. I was encouraged at the response and order fulfillment by Walter Drake. The product is as cheap as the price. Shame on me for thinking this book's could not be screwed up. I would buy again from Walter Drake, but reluctantly so, fearing product quality. Since I had bought this one with refills, I ordered another and will split the pages so it will close easier and have more room... and I added just one or two of the address things so it's not like I had a ton of addresses. It is difficult to center the pages just so it will close, also brok the top ring trying to open it. Now I use a pen through the rings to pry it open. Loved the idea of being able to change those I needed to without scratching out addresses and trying to fit new ones in! But the binder is not big enough to hold all my cards, so I had to eliminate the ones I use less frequent! Bought to keep my contacts at work. Happy with it. 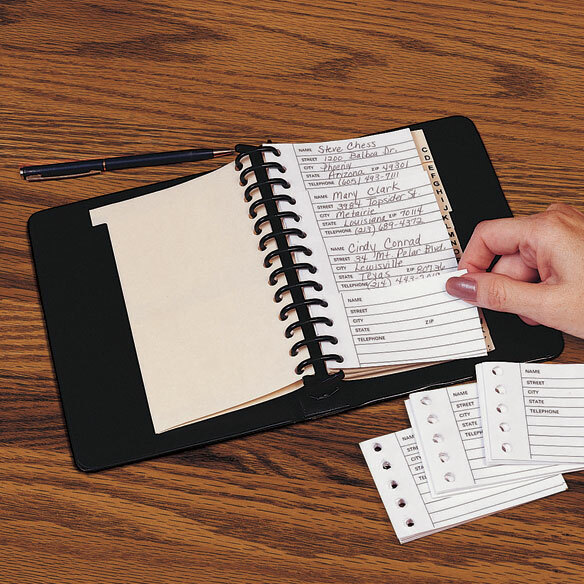 I use an old address book like this (with round metal rings) for my mailing addresses, for which it has worked well. Wanted one for all those darn passwords. However, this size won't hold enough of the inserts. I had to order a second book, which makes the whole thing too cumbersome to carry with me when I'm traveling. If you're just using it for a limited number of entries, it works well, I prefer the metal rings, not these plastic ones. I'm afraid I'll break them. I'd prefer a book like this with metal spine and rings that is about 3" wide. That might hold enough inserts for all my passwords. This is a great idea but, the spiral diameter is too small. If you fill the spiral up more than 4 times, you do not have room to put in any more inserts. The spiral diameter is 1" it should be a minimum of 2". The binder rings & binder are not wide enough to hold all the addresses that I have. The width & length are fine. It looks good in your catalgue, but when I put the pages in, the rings wouldn't stay closed. I ended up ordering another one elsewhere with metal rings. The rings are a terrible design. Not very good quality and size. Way too time consuming to change a lot of address and phone numbers. Would never order again. by the time you insert 100 addresses the book is completely full and hard to add new cards at the beginning and the end of the alphabet. I was told that the pages were hard to turn. Spiral was flimsy. I love the idea of this product, but it is waaay too small. I have to use two books. One for personal addresses and one for business. And even then it's tight. I think about 2 inches or even better 3 inches would be nice. The other beef I have is that the plastic rings are annoying! Whoever thought to make it straight instead of rounded - fail! The pages won't turn smoothly because of it. I have some with round metal rings that turn smoothly, again the binding is way too skinny. I so want to like this product but I can't find a bigger size anywhere! It helps to open and close the ring binder by using both ends at the same time. If the binder were made of metal, as my original book over 20 years old, and metal in the spline, I feel this new one would last 20 years more. I feel that in a very short time, these plastic rings are not going to line up. These little extras would make a big difference. And what happened to the pockets? I bought this address book to keep my email, user names and passwords in. Being able to open the book and replace pages as changes are made work fine but the plastic holder for the cards isn't good. It doesn't open easily to change the page. I'm afraid the plastic will break when opening or closing when changing the pages. I wouldn't buy this again. I bought one of these and they are too small. When you start to add the leaves ti the book it gets off center at mire than half full and won't shut properly. Then you run out of the leaves so you can't finish what you started. For me it us a waste of money and I will never recommend it to anyone. IF JUST ALL THE ENCLOSED DIVIDERS AND ADDRESS REFILLS ARE INSTALLED, THE BINDER RINGS ARE OVERFILLED AND WILL POP OPEN WITHOUT WARNING, DUMPING THE ENTIRE CONTENTS ON THE FLOOR. ADDING MORE REFILLS WILL MAKE IT IMPOSSIBLE TO CLOSE THE BINDER RINGS. SOLUTION IS TO INCREASE THE SIZE OF THE BINDER RINGS UNTIL THE PROBLEM STOPS. PRODUCT R&D: 3 HOURS, TOPS! Cheaply made with plastic rings. Very flimsy and rings are made of cheap plastic and too small. Bought for personal use. Had an old one that I wore out. This one came with the rings not lined up so you can not turn the pages with out ripping them. I would not buy another one. The new ones are not near as good as the old ones. I have the original product from 20+ years ago and it had a metal center post and rings that aligned. One clamp opened it and one closed. The vinyl finally came apart. This one has all plastic parts, no side pockets, & the alpha-tabs do not show when closed because the address inserts cover them up. You have to manually push the rings to close them and one broke the first time I closed it. Very cheaply made. I WOULD RATHER PAY MORE FOR A BETTER PRODUCT. So disappointed. Flimsy plastic binders. They broke right away! The plastic binder broke when I tried to close it!! It was brand new! This adress book is so cheap, I loose my money. I was so excited to find this product. When I opened it and began to put pages together alphabetically, the prongs that held the pages together broke. They were made of cheap plastic, so they are useless. The notebook cover does not close. It hangs up on the odd-shaped spiral in the spine of the address book and will never close. I expected the clamps that hold the pages to be circular for easy movement. The cover is poorly designed. I idea is great but it is not perfected! Price of shipping extremely high. Cost of extra fillers as much as the entire book. Poor construction. Binder broken away from cover when I recieved it. Went on a trip so I have not been able to return it. Pages would not move easily. Oval binder clips instead of circular were cheap quality. Very unhappy..useless piece of junk....threw it in garbage. This is awful! Cheap! Poor Quality! Found it difficult to print information is such small space. Piece of Junk but only one I could find with individual, loose-leaf inserts. Difficult to use; pages stick on bop and bottom opener/closer. Have to push contents down as they hang. Wish someone would make a good one. 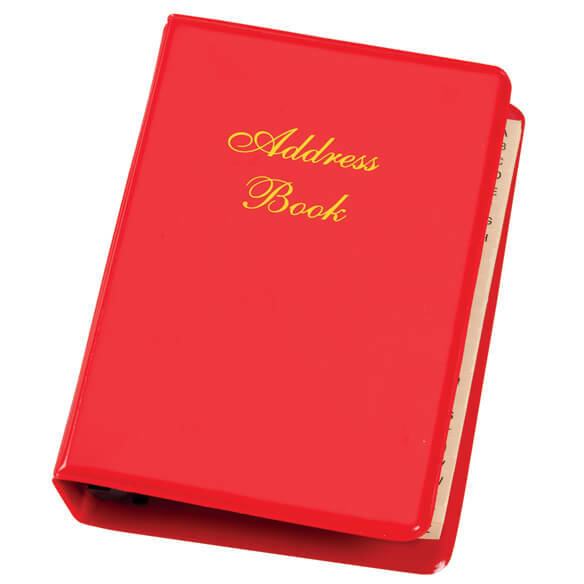 If you have a lot of addresses you need to keep, don't buy this address book. The binder is plastic and doesn't stay closed when you put a lot of pages in the binder. a brad that holds the binder together broke the first night I tried to use it. very disappointed. I am going to try and super glue it as I don't feel like going to the post office and mailing it back for a replacement. If you have a lot of addresses you need to save in your address book, this ISN'T the book for yoju! When I put enough address sheets in the binder, the PLASTIC rings wouldn't stay closed, so it was very difficult to turn pages. I gave up, sent it to a charity, and bought one with metal rings. The concept is good, but the paper is very flimsy, the binder rings misaligned and so poorly constructed they slid out of the cheap plastic cover before I completed my entries. The refill is exactly that - for replacing an existing entry, with no room for additional entries. If you are from a large family and also want to add service people to your address book (dry cleaners, etc.) 100 slips is not enough. When I got to the letter "M", the book was overstuffed and impossible to operate. I decided to cut my losses and pitch it out. The cost of the book and refill were wasted, as was my time writing the entries. Buyer beware! I received one of these address books earlier as a gift and it worked just fine but wasn't big enough to hold all of my addresses so I order a second one to put half of them in. The second one has something wrong with it, The pages stick when you try to turn them and it does not close all the way. It s not a quality product. The rings do not clos properly.Called your rep. & she made a refund..Thank you very much...U R a good company & stand behind your products. The rings are a terrible design. I should have trusted other reviews. Would not recommend . It is a great organizer. I had a previous telephone book. I thought I would be getting the same thing. The new one is made skimpier. The pages are difficult to turn and it is a nuisance. I should have kept the old one. I used to have address books like this one and have been searching for a similar one for years. The other ones I had were a little bigger; The binder rings were also bigger; Could open them flat from the first page, the middle, or the end; Could add endles amounts of new pages. This address book wouldn't even hold the pages it came with and still be able to open properly, turn pages, and add additional pages. It's a poor excuse for a replacement of my old books. wanted to go old school, so numbers were available to all family members not just in cellphone. been using this type binder for many years and it holds up very good. WE HAVE ONE OF THESE AND WE LIKE IT. 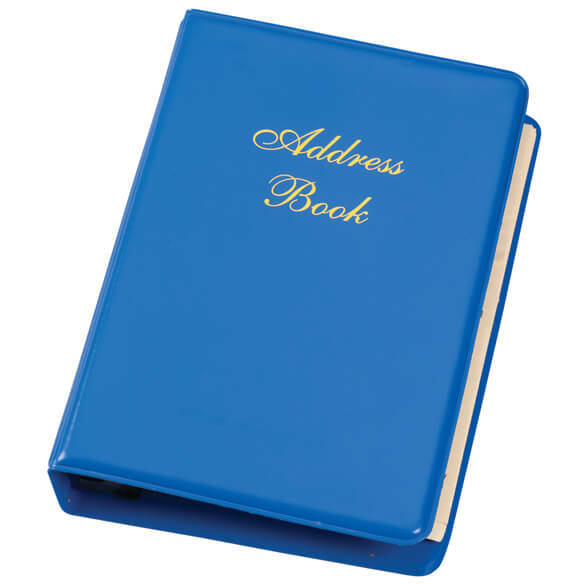 Durable, great looking address book which uses individual address refills. My Emails are scattered all over. Now I can keep them in the same place. "Exact fit to needs. Hard to find. Because every time I needed an address, I did not want to have to go to my computer as wanted it on my desk to use for cards. Looking for a new address book and this looks to work. I need help remembering names, addresses and phone numbers. Had one that worked well and need new one to replace it. Needed this for my online info. Like the idea of being able to correct address and not do write overs on exciting addresses. my mom asked for this. its hard to find them here lol. Opens flat & replaceable refills available. To replace what I have. i use this to keep tract of my DVD's. I had it before and I laminated them and can use them forever. I need a new address book. I've been looking for a replacement address book for some time. My husband doesn't like keeping things on the cell phone and the old address book is a mess of cross outs and write overs. This looks like the best choice I've seen yet. I ordered refills, too. I prefer a desktop calendar that I have tear out sheets. My friends keep moving! I'm so happy to find an address book that I can keep current and not have to continually mark out old addresses. It's almost impossible to find binder vs. spiral type address books, and even harder to find binders AND the proper refills. I purchased the binder and small refills because they were exactly what I was looking for and could not find them anywhere else. Are the rings metal or plastic? The one I had for years was by Recordplate I believe, and it had sturdy metal rings ... was extremely durable. BEST ANSWER: Rings are sturdy plastic. My original was metal like yours. This one seems strong and opens easily. It is not as easy to close the ring but it does work. These rings are plastic, not as good as the recordplate rings. Do you have other sizes? Such as nearly 6 inch by 6 inch? Refill address book pages. BEST ANSWER: Thank you for your question. The refills for this item is item 302638. We do not have any other sizes. We hope this information will be of help to you. BEST ANSWER: Thank you for your question. Yes, they are double sided. We hope this information will be of help to you. printed matter is only on one side, blank on the back side. BEST ANSWER: Thank you for your question. The rings are plastic. We hope this information will be of help to you. 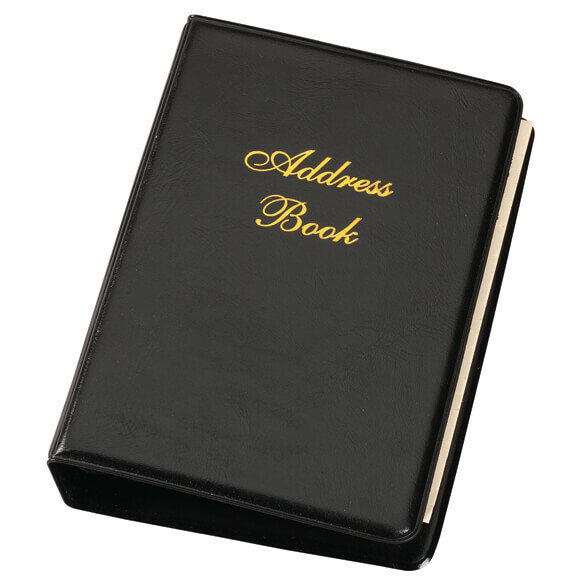 Do you carry the desktop address book with metal rings? BEST ANSWER: Thank you for your question. Unfortunately we do not carry any other address books. We hope this information will be of help to you. need address replacement size 6 3/4 x 3 3/4/? BEST ANSWER: Thank you for your question. Each individual sheet is 2 1/2"L x 3 7/8"W. We hope this information will be of help to you. what is maximum number of addresses including extra pages?